Nora Tahe Bill Stampwork Triangle Wire Bracelet size 6 5/8"
Triangle bracelets of this style have been made by the Navajo for a long, long time. 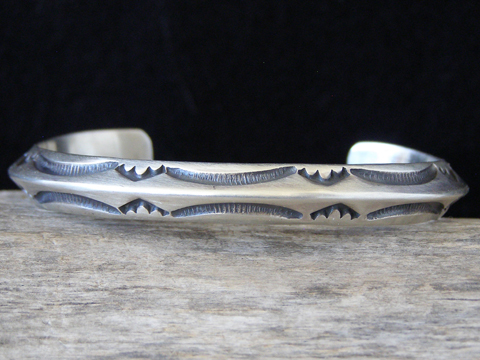 Nora's version uses a heavy-gauge Sterling triangle wire and is deeply stamped on both of the angled edges of the bracelet. She brushed this lightly to give it a light patina and used an oxidizing agent to darken the stampwork design. Simple and beautiful in a slimline design. Hallmarked NORA and stamped STERLING inside.